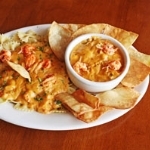 Traditional Cajun meals and Cajun specialties run the gamut from Chicken & Sausage Gumbo to our one-of-a-kind Alligator Chip Dip. Other Cajun appetizers include Crawfish Dip, Hot Tamales and Etouffee, Pork Boudin Balls and Red Beans. Our Cajun Dips are also great over pasta. One of our must-try, all-time favorites is the shrimp stuffed with crab and shrimp dressing. 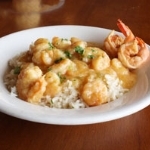 You can order Cajun food online or come into our store if you're in the Tulsa area and enjoy a huge selection of incredibly tasty, authentic delicacies from our Heat & Eat menu. Whether it's the bell peppers stuffed with crab and shrimp dressing, Shrimp & Corn Chowder or the incredible Shrimp & Crab Cakes, your only question is going to be what took you so long and when can I get some more! We also have perfectly seasoned mixes for home-cooking use, including Cajun Ed's Jambalaya and Fry Mixes.